When you get older, your back aches. Why? One explanation is those cushy shock absorbers called nucleus pulposus (NP) between your vertebrae that provide support, spine, mobility, and equal weight distribution are worn down. Unfortunatley you can't exactly take your vertebrae to the mechanic's shop for a tune-up. But thanks to a new biomaterial created by researchers at Duke University, old aching backs might get some relief. 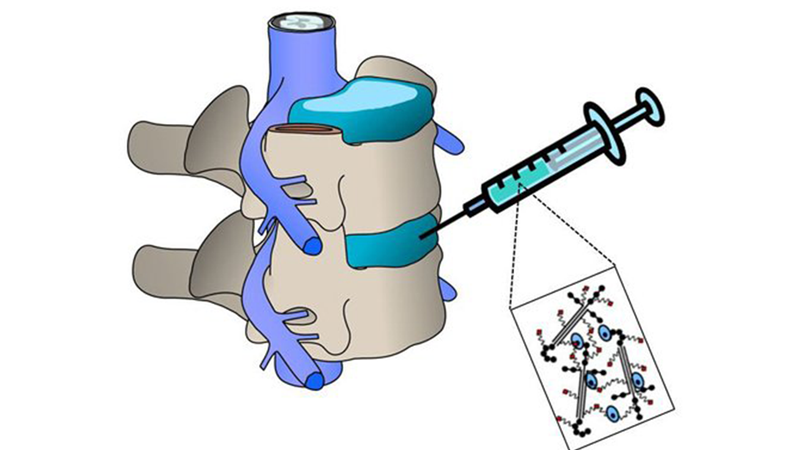 The material is a liquid full of regenerative cells that's injected directly into the tissue in between the vertebrae. Once infused, it turns into a gel, which helps hold in the healthy NP cells, helps repair damaged cells, and aids new ones in forming.